We’d love your help. Let us know what’s wrong with this preview of Being Awesome! 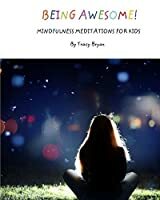 Mindfulness Meditations for Kids by Tracy Bryan. Mindfulness Meditation is a way to practice mindfulness. It's easy, and the more you practice, the easier it gets. If you try to practice a little bit of mindfulness meditation every time you can and even daily, you will feel great! To ask other readers questions about Being Awesome! Mindfulness Meditations for Kids, please sign up. Tracy Bryan is an award winning self-published author for kids aged 4-12. She writes whimsical non-fiction picture books about emotions, coping skills, mental health and mindfulness. Tracy also likes to tackle social issues and speak directly to her readers about important topics that affect everyone. Tracy hopes to educate, inspire and empower kids and their families with her books. Currently, Tr Tracy Bryan is an award winning self-published author for kids aged 4-12. She writes whimsical non-fiction picture books about emotions, coping skills, mental health and mindfulness. Currently, Tracy is releasing her debut fiction picture book called Put Away Your Phone! For more details and a quick preview, click here. Tracy writes a monthly personal Blog for adults on her website and one for kids aged 6-12 called The Awesomeness Blog. Follow her on Facebook , Twitter , Goodreads & Amazon. To learn more about Tracy or contact her, please email tracy@tracybryan.com or visit her website tracybryan.com.